Your Christmas shopping is done. Your Nutcracker run is over (or almost over, hopefully). Now is the time to start looking ahead to 2016. Yup, it's the time for resolutions. Over the next week, many dance artists will make goals to take their career to the next level. Maybe you're a choreographer who wants to get better at applying for grants. Or a freelance dancer who hopes to improve your time management. Well, we've got a present for you: Springboard for the Arts has released a series of resources to help artists build their business skills. And it's all free. Called Work of Art, the professional development program includes 12 exceptionally engaging online videos that cover everything from developing a business plan to building a portfolio, such as a reel of performance footage. 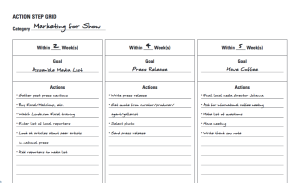 It also offers an interactive workbook of lessons, exercises and resources to help you develop strategic goals—and accomplish them. (All you have to do is email creativeexchange@springboardforthearts.org for a free downloadable copy.) The best part? All the advice is by artists for artists, with tips from TU Dance's Toni Pierce-Sands and Uri Sands, plus footage of their company in rehearsal to break up the business speak.